The ELECTRIC RUN will be lighting up the city again as AmMetLife ELECTRIC RUN RECHARGED happens at Anjung Floria, Precinct 4, Putrajaya. And you know what...my daughter is jumping up and down since we got our tickets as AmMetLife ELECTRIC RUN RECHARGED is bringing Hip Hop artiste Silento down to Malaysia for the night to make his debut performance in Malaysia. You know that "Watch Me" song... which has about 1.3 billion views on Youtube and peaked at No. 3 on the Billboard Hot 100, yeah... that dude Silento will be headlining the celebration at the finish line. Do not forget to catch our local artistes, CUURLEY, Blastique & Amanda Avyanna, SonaOne and De Fam LIVE in action too... so expect it to be one of the most memorable nights of 2017..
AmMetLife ELECTRIC RUN RECHARGED is organised by Livescape Group and supported by Malaysia Major Events (MME)... And this nocturnal fun run is set to attract over 18,000 runners of all ages. As participants run, walk and dance their way to the finish line, their senses will be stimulated as they encounter various unique activities, each more engaging than the last, music and lights to allure as well as mesmerize runners to the celebration at the finish line. The run this year will feature a couple of added enhancements with the most prominent being the RECHARGED concept. Personally I am so stoked as all the participants at AmMetLife ELECTRIC RUN RECHARGED will each be receiving a limited edition PIX Mob bracelet (you know the one they got at the Coldplay concert...) in addition to the official race tee, finisher’s medal and race bib, how exciting is that... So get ready to feel the beat as the pulsating light from the bracelet illuminate neon lights to guide participants to the themed dance party zones, accompanied by music every kilometre of the run, providing runners with a truly immersive experience. The fun run trail will transport runners through a light and sound journey through time, with each zone representing a unique colour theme and music era. AmMetLife ELECTRIC RUN RECHARGED will take place at Anjung Floria, Precinct 4, Putrajaya on 29 July 2017. Registrations are currently priced at RM88.20 per person (Group of 4) and RM98 per person (Individual). Children under the age of twelve do not have to register but do not receive a race pack. All prices listed exclude the RM4 ticket processing fee and 6% GST. 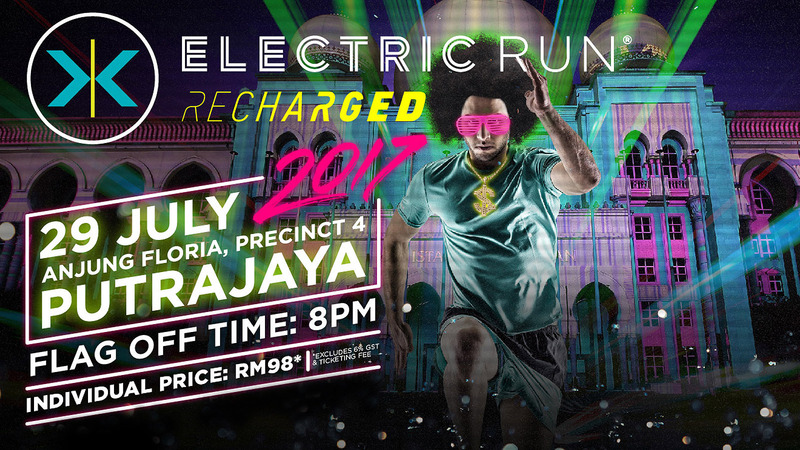 Registrations can be done via www.electricrun.my or through http://www.galactix.asia/electricrunmy-2017. Twitter at @electricrunmy and Instagram at @electricrunmy.